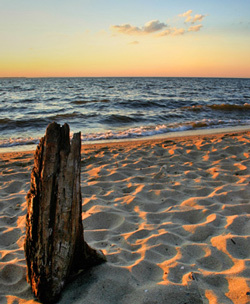 Cape Charles is a small town on Virginia's Eastern Shore with a great location on the Chesapeake Bay. The town is located about 10 miles north of the the Chesapeake Bay Bridge Tunnel, making it a pretty convenient trip from the Hampton Roads area of Virginia. The town was founded in 1884 as a planned community to serve railroad and ferry traffic. The Little Creek - Cape Charles Ferry used to depart from here before the Bay Bridge Tunnel was constructed. Railway barges still leave from Cape Charles, taking cargo trains across the bay. There are several restaurants and shops in the town's historic downtown district, as well as some restaurants in the Bay Creek Resort area of town. Bay Creek is a residential development with very attractive Arnold Palmer and Jack Nicklus signature golf courses. The town of Cape Charles has a half mile long sandy beach that's free to the public. The water here is calm, so it's a nice place for families with small children. There's a public pier for fishing located adjacent to the beach. More information about the beach and pier. 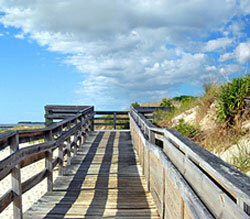 Additional beach access is available at Kiptopeake State Park, which is about a 15 minute drive from town. Colonial Home One Block from Beach This Colonial-style home is a duplex unit. You can rent either side. Comfortable, well-equiped interiors and amenities such as laundry room, outdoor grills, and bicycles. Within walking distance of both the beach and the historic downtown district, where there are restaraunts and shops. G.G's Sea Glass Inn. Located five blocks from the beach. This historic district home has three bedrooms and two baths. Capacity to sleep from 9 to 14 guests. Non-smoking. Bay Creek Condo This vacation rental is located in the gated community of Bay Creek Resort. The resort has Jack Nicklaus and Arnold Palmer designed golf courses, swimming pools, tennis courts, and a private beach. Three bedrooms and two full baths. 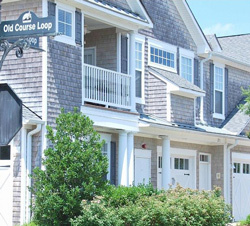 Bay Creek is just a few minutes drive to downtown Cape Charles. New 3 Bedroom, 3 Bath Home Near Town. This rental is outside of town but close by, in a community between Route 13 and downtown Cape Charles. New construction home. Each bedroom has it's own bathroom. You'll have access to community amenities, including the community swimming pool, tennis courts, and pier. 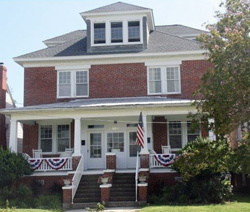 See Additional Cape Charles Vacation Properties There are over 100 to choose from! Still More Cape Charles Vacation Rentals - Take a look additional listings at FlipKey by Tripadvisor.